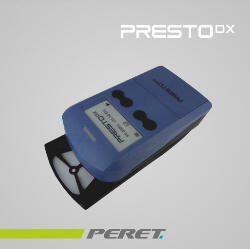 The PRESTO DX Basic densitometer ist the easy to use densitometer with grafical display for the press room. The high contrast, zero power display never goes off and shows the most recent measurement data even the next day. The PRESTO DX Basic measures density, dot gain, dot area, balance, and trapping. You can configure the device to compare measurements to internal density and dot gain references.